Located on the north side of the American River College campus there is a spot every student needs to visit at least once a semester: The Beaver Bookstore. Sliding glass doors open to reveal shelves of snacks and school supplies. Practically anything a student could need, from Scantrons and binders to umbrellas and headphones. On the far side of the store is school spirit-wear, sweatshirts and scarves, hats and backpacks emblazoned with the ARC logo. Then, located in the back of the store, students will find the textbooks:rows and rows of shelves housing any required reading for a class on campus. However, where you would expect to see lines of haggard students, impatient to buy their last minute textbooks, there are none. No line of students, no stressed worker trying to locate desperately needed textbooks. It’s the second week of the spring semester and the college store is virtually empty. This is not the first semester the campus store has experienced a significant decline in customers so early in the semester. “I noticed it last fall, fall 2017. Usually we get hit for like the first two weeks now its only been like a week straight,” said Misha Hasverse, who has worked at the store since the fall of 2015. A leading factor in the decline of customers could be the rise of online retailers. “A lot of people are getting hip to Amazon and Chegg,” Hasverse said. For many students it’s more practical to buy from online retailers. For example, if a student were to buy “Effective Management 7th Edition” by Chuck Williams, a required text for a Techniques of Management class, from the campus bookstore, it would cost that student $179.25 for a used textbook. That student, however, could by that same textbook for only $41.98, with shipping included, from Amazon. The manager of the bookstore declined to comment for this story; it’s unclear and so it is unknown how these lower textbook sales will affect how the bookstore is run in the future. The Educational Opportunity Program, is designed to help low-income and educationally disadvantaged students receive a college education;, one way they do so is to provide grant money for their students. The bookstore also provides students with the opportunity to bring in their class list and present it to one of the employees. That employee will then look up the course requirements, and help the student locate everything he or she needs. 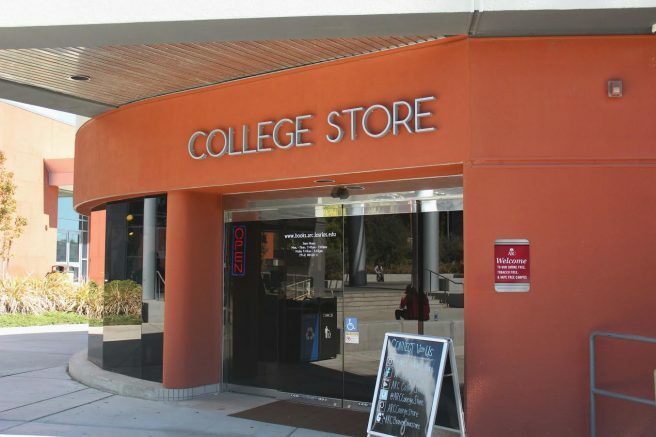 “We look up their classes and then we find their textbooks, and then we go ahead and tell them what option we have,” said Lindsey Simental, who has been employed at the college store since fall 2016. They also typically provides new or used options for textbooks. “We will let them know if the book is rentable in case they want to rent it…[the students] have the options to choose what’s best for them,” Simental said. The store often carries different types of books as well, such as hard cover, loose leaf or spiral bound. “But loose leaf is often cheaper, so we are usually always trying to help the customers look for the cheaper option [and] let them know what we have available,” said Simental. The majority of the bookstores money is made from textbook sales at the beginning of the semester. “The only thing that really keeps us going during the semester is snacks. Snacks and drinks definitely. Or Scantrons,” Hasverse said. Be the first to comment on "Campus bookstore threatened by online retailers"